"A complete guide to the biggest Euro Lottery – EuroMillions"
A warm welcome to Global Lottery Review's European Lottery overview page – the EuroMillions mini-website. The Euro Millions is such a vast subject and lottery game to cover that we felt it warranted its’ own dedicated mini-website – a site within a site so to speak. This great Euro Lotto is without doubt the most widely played & most often talked about of all the Euro Lottery games and provides a whole lot of excitement for millions of people every week. It is incredibly well known and highly popular throughout all the 13 European countries that participate in it. Of course with the presence of bona-fide online lottery ticket sales companies – people from all over the world also play lottery online with the EuroMillions these days too. Companies such as TheLotter allow lottery players from all corners of the earth to play Euro Millions with confidence and ease and have made it popular to buy lottery tickets online. We have already written in depth about almost every possible aspect of the Euro Millions lottery so here we are simply going to provide an easy to navigate list of all the different EuroMillions pages that you can visit. For any other lotteries around the world you can simply go to the World Lotteries section for a complete list of lotteries that you can read about and buy lottery tickets online for. 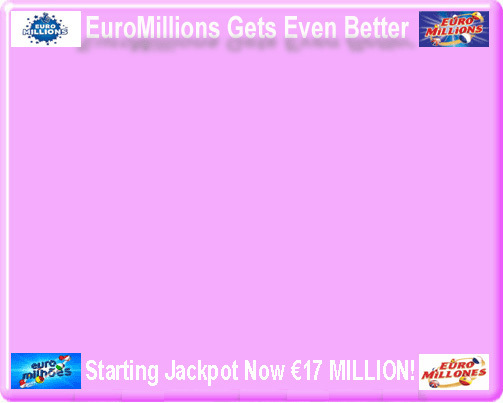 On this page we take a general look at the EuroMillions game and cover some of its’ history. The Euro Millions is the biggest European Lottery game around. If it’s a general overview of the massive Euro Lottery – Euro Millions – that you are looking for then this would be the best page to read through to begin with. Here we take a look at the advantages of playing the EuroMillions as part of a syndicate. The idea here is to easily and vastly increase chances of winning lottery games such as the Euro Millions quite considerably by playing in a lottery syndicate. After a lot of good research – we examine what we believe, in our opinion, to be the best EuroMillions syndicate options and compare the odds of winning the lottery whilst playing in the most popular EuroMillions syndicates. This is where you can check the latest Euro Millions results. Each week the current EuroMillions results are updated soon after the draws every Tuesday and Friday and we post them here as soon as we have them. There is also a whole section here where you can read all about the Euro Lottery – Euro Millions results. If you are looing for past Euro Millions results then just click on the link above which will take you to a section where you can choose the week you want and view the EuroMillions results for that week. Many Euro Lotto players very often meticulously use previous Euro Millions results to help them choose their Euro Millions numbers for the current draw. We take a look here about everything to do with the drawing of the Euro Millions numbers – how to pick them, how many lottery numbers you need to choose from and the various ways you can select your EuroMillions numbers. We can’t, of course, tell you which will be the winning lottery numbers but we can advise you on how you can gain an advantage when making your own selection of Euro Millions numbers for the latest draw. This section discusses the Euro Millions jackpot and what makes it one of the biggest lottery jackpots not only in European lottery games but throughout the whole lottery world. We look at what the average EuroMillions jackpot is and see some of the figures that the Euro Lotto jackpot can rise to as well as how the Euro rollover helps the EuroMillions jackpot to reach such high levels so quickly. By going to this section you will be able to see what the current EuroMillions rollover jackpot is. If you bookmark this page or save it to your favourites you will always have at your fingertips – the latest EuroMillions rollover. The Euro Millions rollover jackpot can climb to such great heights very swiftly so it is always very useful to know exactly what figure it's reached at any given time. Euro Millions prizes are discussed here – along with the numerous categories of prizes and how you can win them. We look deeper into the odds of winning the lottery and see just how the various Euro Millions prizes are calculated. How the rollover impacts on the EuroMillions prizes is explained and we look at some of the record Euro Millions prizes that have been won over the years. Anything you want to know about EuroMillions tickets can be found here. How and where you can get EuroMillions tickets both on the High Street and online – if you want to find out about how to buy EuroMillions entries over the internet and learn how best to play the Euro Lottery online. This section also covers the aspect of buying EuroMillions tickets from abroad. This interesting section covers the subject of very useful EuroMillions statistics and how you can use them when selecting your own Euro Millions numbers. Many Euro Lotto players study the Euro Millions statistics – such as the most and least frequently drawn lottery numbers when they play Euro Millions – aiming to gain an advantage over other Euro Lottery players. Here we delve into some of the most important and basic of the Euro Millions rules that all players need to be aware of. This section covers the likes of the Euro Millions prizes, EuroMillions tickets and EuroMillions rollover which are all governed by particular Euro Millions rules and are very useful to know when playing. Nobody wants to get caught out with a scam and in context with this website – especially lottery scams – and in this particular case a Euro Lottery scam. These have been quite common over the years so we advise here what to look out for especially when you play lottery online and show what the typical Euro Lottery scams look like. We even provide an example of a lottery scam email so that you know exactly the kind of thing to watch out for and avoid. Wouldn’t it be great to have your story here – that’s what we’d all like to see. Here we look at some Euro Millions winner stories and see a little deeper into the minds of the Euro Millions winner. We see some of the mind-boggling record Euro Lottery wins over the years and cover the largest EuroMillions jackpot ever won to date. Here we look at one of the great lottery strategies and how you can seriously increase chances of winning lottery games such as the Euro Millions. We discuss how it is very possible to stack the odds of winning the lottery in your favour and how it is very much possible to get certain Euro Millions numbers matched even before the EuroMillions draw takes place. EuroMillions players in Portugal will recognise this terminology – as the Euro Milhoes is what the name the Euro Millions is known by in Portugal. It is looked after in Portugal by the Portuguese Lottery – Jogos Santa Casa. We explain how the EuroMilhoes is no different from the Euro Millions and is in fact exactly the same Euro Lottery game. In Spain, the Euro Lottery is known as the EuroMillones and we study the Spanish offering of the game here. Once again, there is no difference between the EuroMillions and the Euro Millones – just a slight change of name. If you are Spanish or have any Spanish connections you are sure to recognise the name EuroMillones that is offered in Spain by the main Spanish Lotto company – Loterias y Apuestas del Estado. One last slight difference in name that the EuroMillions lottery has is the EuroMillionen which applies to Austrian Lottery players. In Austria the EuroMillions game is called the EuroMillionen and we explain about that in this section. The Euro Millionen is by far the most popular game offered by Osterreichische Lotterien – the Austrian Lotto company – and once again is exactly the same game as the EuroMillions. For our Portuguese readers we have provided a section here solely in Portuguese that talks about the EuroMilhoes (EuroMillions). If Portuguese is your national language you will hopefully find this useful to obtain information about the Euro Milhoes lottery in your native tongue. If Spanish is your native language this section covers all aspects of the EuroMillones entirely in Spanish. We see how the EuroMillones operates, look at some history of the Euro Millones and discuss how you can play the Euro Lottery – EuroMillones – whether you live in Spain or anywhere else across the world. Lastly we look at the EuroMillionen in German for our German speaking readers in Austria and abroad. The EuroMillionen is particular to Austria and this page will hopefully be of benefit to all our Austrian Lottery players whose primary language is German – and of course for any Euro Millionen players outside of Austria who also speak the language. Just click on any of the above links to take you to your chosen EuroMillions Lottery section. Each page contains a detailed review about that particular aspect of the EuroMillions game. We will, in time, be adding even more pages to the Euro Lottery mini-website and will include them in this overview section as and when we do. In the meantime, enjoy reading all about the primary areas of the Euro Lotto and we wish you the very best of luck should you decide to participate in it. Some exciting changes to the EUROMILLIONS took place on Sept. 24th 2016.